McCallum Bagpipes was formed in 1998 by existing partners, company directors Stuart McCallum and Kenny MacLeod. Stuart and Kenny had known each other for years through piping before starting the company, having both been members of the Glasgow Skye Association Pipe Band. Kenny was already selling practice chanters made by Stuart when he was in California. They were an instant success so when Kenny came back in 1998 they decided to join forces and develop bagpipes and pipe chanters. The company started out under the crammed conditions of a shed in the McCallum Timber Buildings yard in Kilmarnock’s Moorfield Industrial Estate, but quickly outgrew its surroundings and moved to a self contained unit nearby which enabled the company to increase its workforce and manufacturing capability. In the following years, the company has continued to outgrow itself and expand its output. 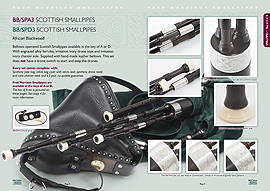 In a short period of time, McCallum Bagpipes has developed into the world’s leading bagpipe makers. Why? Most of our team are pipers and take great pride in there work. They want to be associated with the finest bagpipes and will always give you their best advice and assistance. McCallum Bagpipes now occupies 10,000 square feet of unit space comprising our fantastic factory and beautifully appointed showroom dealing in bagpipes, smallpipes, percussion and highlandwear under one roof. You can be sure when you buy a McCallum Bagpipes instrument that you are making a sound investment. Company Director Stuart McCallum is the founder of McCallum Bagpipes. His background lies in precision engineering, as a time served tool maker with a specialised knowledge in programming and operating CNC machinery. He worked for a local Kilmarnock engineering company, McCrindles Tooling. They were suppliers to many big companies and made engine parts for Rolls Royce and the aero industry. He progressed from engineer to foreman to production engineer and his job was to programme the CNC milling and turning machinery. Stuart uses all the precise skills and tolerances he used in his engineering background when making bagpipes. With a keen interest in machine technology development, Stuart possesses a constant drive to exceed the company’s unrivalled manufacturing standards. Stuart directs all factory operations, focusing primarily on all design, manufacturing and quality control aspects of the bagpipe making process. Stuart himself is an experienced piper. He has won a number of major RSPBA championships in Grade 1 with ScottishPower Pipe Band and Strathclyde Police Pipe Band. Kenny MacLeod has been involved in making and selling bagpipes since 1982, working for Kintail in Cumbernauld and Glasgow. In 1988, he was one of the founding partners in his own company, MacLeod Highland Supplies. That proved to be very successful in a short period of time, selling bagpipes and all pipe band equipment. In 1995, Kenny sold his share in MacLeod Highland Supplies and moved to Los Angeles, California to play with the Los Angeles Police Pipe Band. He also started selling bagpipes and teaching while he was there. It was really hard to get supplies of pipes and chanters at that time so Kenny asked Stuart if he could make practice chanters to help with delivery times. Kenny deals mainly with the public side of the company, overseeing sales, public relations, advertising and administration. As McCallum Bagpipes expands its international base of customers, Kenny often travels to overseas events as an ambassador for the company. A popular face in the piping world, Kenny has a lifetime experience behind him having led as Pipe Major of the Phoenix Honda Glasgow Skye Association Pipe Band and performed with other top Grade 1 pipe bands.